Eight hours after completing Ultra Trail du Mont Blanc, I returned to the finishing chute. With a pronounced limp in my sore left knee, I took stiff steps, zombie-like, down the empty corridor. Half-detached banners fluttered in the wind, adding a ghostly ambiance to the quiet streets of downtown Chamonix. It was 2:16 a.m. I rounded the corner to the finish line — brightly lit and deserted, as though a crowd of party-goers left in a hurry and forgot to turn out the lights. I leaned against a street lamp and eventually slid to the sidewalk, too exhausted to stand. Fifteen minutes passed in this trance-like state, the eerie ghost-town silence, and the wind amplifying the 38-degree temperature. Finally, two figures approached — one wearing a dim headlamp, the other with a familiar profile also strolling with a pronounced limp. I pulled myself to my feet and waved my arms weakly as Daniel and Beat rounded the final corner. Just eight hours earlier, when I finished my 110-kilometer, 23-hour run of UTMB, thousands stood in the square to cheer for runners. There were hundreds of waving banners, live images on a huge screen, and motivational slogans shouted over loudspeakers. Now, after 290 kilometers and 125 hours of La Petite Trotte Leon, I was the only person left to cheer for team "Too Dumb To Quit." After they crossed the finish line, I held up my camera and Beat turned to face me with a glazed smile. Given the places they'd traveled, the challenges they faced, and the mountains they'd climbed in the past five days, it seemed fitting that their event should end so quietly. If UTMB is the charismatic star of European trail running, PTL is the genius older brother who goes about inventing mad schemes in the attic — brilliantly brutal schemes. Beat is working on typing his own story about PTL, so I won't blather too much about it here. But I do need to admit a little lingering jealousy about their experience. When I saw photos of the mountain vistas they saw, the refuges they visited, the vertigo-inducing ridges they traversed, the streams they crossed, and they snowy peaks they tracked over, I believe my first words were "I picked the wrong race!" Not that I'm a strong enough "runner" for the PTL, not yet. I believe it would take at least a couple more years of building my base, toughening my feet, and improving my technical skills before I can even dream about tackling a challenge like the PTL, which is unsupported, full of class-four and even class-five scrambling, and includes 22,000 meters of overall climbing to boot. 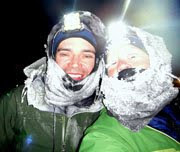 Beat and Daniel, and also our Bay-area friends Steve and Harry, completed the course this year. I'm in awe. This brings me to some final thoughts about UTMB. It was an event unlike anything I've experienced, and that was exactly my aim in participating. As much as I admittedly envied the quiet mountain run Beat and Daniel experienced, that's certainly not what I was expecting from UTMB. I knew it would be a crowded, loud affair. I knew, based on weather-related changes and cancellations in past years, that there was a strong chance the event would be disrupted. I knew my chances of finishing (the full event) were fairly slim. My journey to UTMB started out as a bit of a light-hearted joke when I threw my name into the lottery in January. I was shocked to learn I even qualified, and since Beat was planning to race PTL anyway, I figured I had nothing to lose. I didn't even tell Beat I was entering the UTMB lottery. I was embarrassed, admittedly — not only because I felt vastly underqualified, but because I also knew UTMB wasn't really "my kind of event." Lots of people. Lots of hype. Lots of running. So I didn't belong. But that, in a way, was its own appeal. As a runner, I'm undoubtedly still a beginner. I still feel awkward and uncomfortable in my movements any time I exceed eight-minute miles on pavement. All through UTMB, my left elbow throbbed with pain — a reminder of the two silly crashes in routine training situations that happened just weeks earlier. I have remnants of shin splints that cropped up while I was hiking. And UTMB is effectively the World Cup of trail running. What beginner wouldn't be excited about an invitation to an event like that? I felt like a Little League kid invited to step up to the plate at the World Series. And while I certainly didn't smack the ball out of the park, I feel like I landed a solid base hit. Who wouldn't be thrilled about that? Who wouldn't feel encouraged to continue pursuing this worthy hobby? As for experience itself, I think my race report made it sound more unfun than it actually was. I had my frustrations that I wrote about, but for much of the time I truly was enjoying myself, especially the parts when we were higher on the mountains at night (my favorite parts of the race tended to be others' least favorite, go figure.) There were a few genuine jerks on the trail, especially that guy who simply jumped over the woman who fell into the mud (I offered a hand when I approached, but she was standing by that point.) But a large majority of the two thousand runners on the trail were courteous, which was good for me, as my pace rarely matches those around me. Alongside others who are moving my "speed," I tend to be faster uphill and much slower downhill, and this results in my trying to pass others during climbs and subsequently getting passed a lot while I'm moving downhill. Most people are likely able to maintain a more even paceline. So my experiences with "jostling for position" were likely more pronounced than others'. Even still, many people actually moved over for me while climbing or waited for an opening to pass on the descents. So yes, there were a lot of people, and yes, the trail felt overcrowded — but really, that's all part of the "UTMB experience." It was intriguing and motivating in its own way. Would I go back to UTMB? It's tough to say. I think it's a grand stage, but I'd rather wait until I am a stronger and more assured runner, should that day ever come. I would love to circumnavigate the Tour du Mont Blanc independently, and I might get my chance just yet. Until then, I wanted to post a few of Beat's pictures from the grand mountain adventure of the PTL. Oh my, what stunning pictures, no wonder you want to do it!! It looks like a lot of variety and fun too (taking out the obvious fatigue issues) - hey, I'd walk it happily! Funny, I'm the same way - pass people on the climbs, get passed on the descents. Love Beat's pics - looks like he got to see some AWESOME scenery! Outstanding! Looking forward to Beat's report. I can't imagine what the PTL must have been like after doing UTMB. Perhaps you'll be back to Chamonix then?!? I found your blog and books while searching for information on Alaska. I have been following for awhile. I hope to live for a year or two in Alaska and "workamp" there as I am now a full-time Rv'er. My comment to you now is that I don't understand why you do these races and beat up your body. I enjoy hiking and biking and being outdoors but have no desire to do any kind of endurance race such as you do. Those are some of the best mountain photos that I have ever seen. WOW. I'm liking Beat's race. Nostalgia: A good reason to run 100 miles?